This is FULL TIME! Must be available Friday, Saturday, Sunday, Monday, and Tuesday. Sick of unprofessional work environments? Want to work in an environment that values your hard work? Find your new home at Autograph! 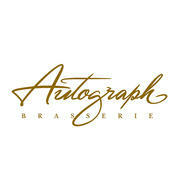 An Autograph Brasserie Server will be an expert at welcoming our guests into our home with warmth, enthusiasm, and grace in this fast-paced, multi-faceted, neighborhood cafe. This candidate will have a desire to continue to learn and grow within our organization.